Two days later on the 16th. of October 1914, on a grey, windy Wellington morning a line of troop transports and their naval escorts steamed out of Wellington Harbour. Alfred Cameron was on board the Tahiti with 600 men, 30 officers and 282 horses. Very few of the men on board knew for sure where they were going. It was simply enough to be off on their great imperial adventure. Most assumed it would be England for more training and then France and that the show better not be over before they got there. The landings on the Gallipoli Peninsula were the idea of the first Sea Lord of the British Admiralty, Winston Churchill. The object was to capture the Dardanelles Straits, steam through to the Turkish capital, Constantinople and force the Turkish Government into submission. As the days get hotter, the fighting more desperate and the dysentery and disease more rampant his belief that they will ‘give them a smasher’ is replaced by the reality of the military stalemate. He remained at Gallipoli until some time in July engaged in what had became a desperate activity for both sides, tunnelling under one another’s trenches to plant explosives. Alfred and a team of tunnellers had reached the Turkish trench when the Turks blew up the end of the tunnel. An attack by the New Zealanders held off the Turks until the wounded team of tunnelers had been dug out and carried back to their own trenches. He was evacuated to hospital in Egypt and then returned to New Zealand where he married and became a farmer in South Canterbury. The last New Zealand troops slipped away from Anzac Cove in the early hours of the 20th of December without the Turkish forces realizing they were leaving. I have been through the Gallipoli Straits by the sea, as well as on both storied shores many times. Most memorable to me is a visit in 1967, when my new bride and I, accompanied by my mother and father, drove down the Gallipoli Peninsula from Istanbul. It was on our lengthy drive that my father, General Kemal Atalay, then the Undersecretary of Defense for Turkey, first told us the story of his own father, and the family’s connection to Atatürk, né Mustafa Kemal (there were no last names in Turkey until 1934, when Atatürk introduced legislation for everyone to generate family names). My grandfather, Ismail Hakki, was born in Thessalonica in the same year (1881) and on the same street where Atatürk was born. They were childhood buddies, and they fought together in the trenches of Gallipoli during eight months of 1915. A photograph was taken of my grandfather’s battalion during a break in the action. Immediately after the cessation of hostilities and the withdrawal of the ANZACS, my grandfather briefly traveled to Edirne (Roman Adrionople) on assignment, and while there, on January 1, 1916, had a photograph taken of himself. He inscribed on the back of the photograph, “To my dear aunt, I survived eight months of action in Gallipoli. I will soon leave for the Eastern Front, there to face the Arabs and their “recalcitrant English leader” (Lawrence of Arabia). Just before leaving for the Eastern Front, he briefly visited the small town of Biga, located to the east of Çanakkale and Troy, there to see his young family, ensconced in the town since shortly before the war began. There were his wife and three young children, two years apart in age – the oldest, a daughter; the middle, a son; and the youngest, another son — my father, “Mustafa Kemal”— named after Ismail Hakki’s childhood friend, and in accord with his friend’s wishes. He died in action in 1916. 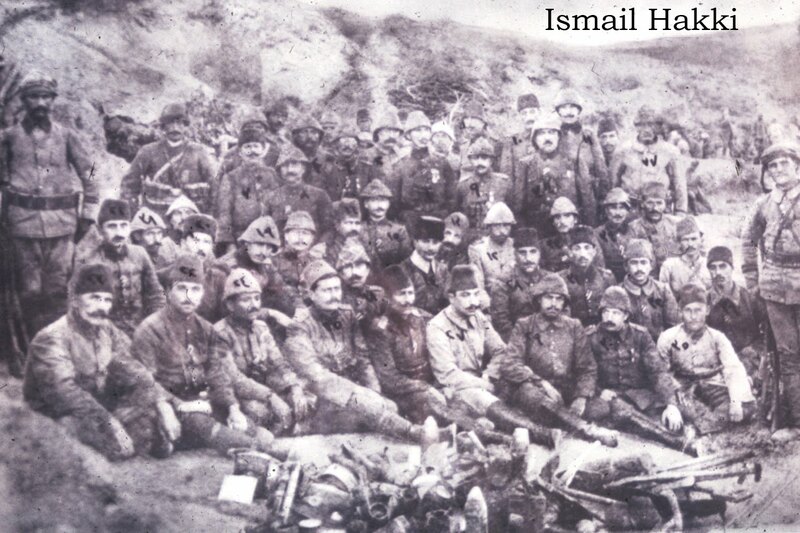 Group portrait of my grandfather's company during the Gallipoli Campaign. He is seen standing in the rear row and approximately two-thirds of the way from left. 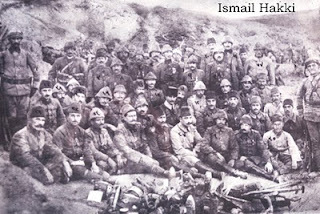 The photograph hangs in the Naval Museum in Çanakkale (1915). Atatürk’s poignant message is inscribed in the Turkish Monument to the Unknown Soldier in Gallipoli, and it is inscribed on the Atatürk Memorial in Wellington. 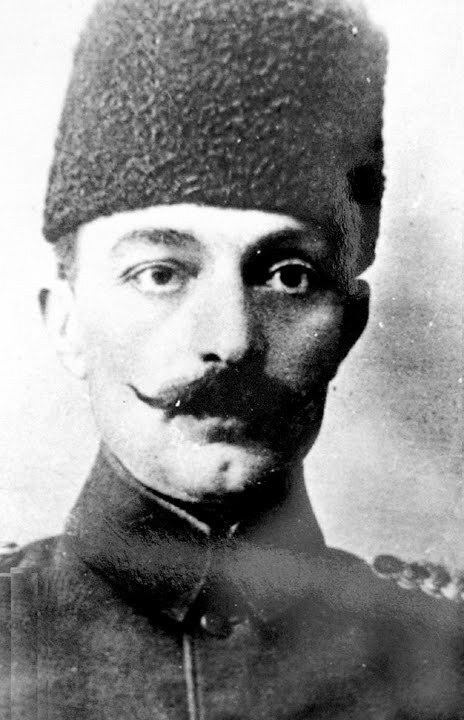 It is no wonder that in New Zealand, there is still a sense of kinship for Atatürk and the Turks — one time enemies, but fellow witnesses to the unspeakable horrors of trench warfare — and, conversely, a resentment of the British politicians who sent a generation of their young men to fight and die in a land half-a-world away. For the Turks, the New Zealanders and the Australians, Gallipoli would forever be regarded as the moment when they gained their national identities. By Bulent Atalay, PhD, Professor of Physics. This summary of my work by by Melody Thomas featured in Artzone Magazine, issue No. 45. Wellington artist Bob Kerr sees beauty in landscapes that others might think leave a lot to be desired. The scrubby hillside; the tyre-marked beach; the windswept marsh; the big, square processing plant beside slate-grey river – all are top fodder for Kerr’s hungry paintbrush, “Pretty is boring. I don’t really want to do happy endings. I want to do questions he says. Perhaps best known as a writer and illustrator of children’s books, Kerr has spent the past 12 years focused instead on painting familiar yet often eerie and unnerving landscapes. “I like to call them ‘extremely unfashionable history landscapes.’ You want a pile of conical dirt on a dead goat hanging in a modern gallery with a curator dressed in black, you’ve come to the wrong shop,” he jokes. You may be familiar with Kerr’s landscape work already – one of his paintings is on the cover of Michael King’s bestselling Penguin History of New Zealand. It’s fitting; as Kerr’s work is largely inspired by the stories of historical figures, some well-known – like Kiwi pacifist and anti-war activist Archibald Baxter – and some largely unknown. Images of Wellington’s south coast and harbour entry in series The Rocky Barron Hills reference the sketches and descriptions of young draftsman Thomas Shepard onboard Captain James Herd’s Rosana in 1826. Kerr’s series Hell Here Now is based on the Gallipoli diary of Canterbury farmer Alfred Cameron – depicting the Gallipoli Peninsula sprawled across ten panels with excerpts from Cameron’s journal scribbled at top and bottom, his entries disintegrating from wild optimism at his journey’s start, to bleak resignation at its end. The Man Who Moved New Zealand was spawned by the work of “grumpy old gold prospector”- turned-geologist Harold Wellman on the Alpine Fault, and featured in The Makers of Modern New Zealand 1930-1990 a recent NZ Portrait Gallery exhibition curated by Brian Easton. Kerr seems drawn to explorers and rebels, scientists and accidental poets - one wall of his Wellington studio is piled high with biographies, atlases and histories - and turning his light on these subjects, Kerr makes beautiful their often-miserable stories and environments. And while Kerr’s paintings are essentially about people, the people themselves are rarely present on canvas. “I like the idea of the viewer having to put themselves in the painting... I want them to ask, “what happened here?’” he says. And Kerr’s not one to give away the answers. “There’s a corner of the art world that’s about making things to go with the curtains, works that reassure people… But I don’t think it’s the job of good art to be reassuring… I’d rather tip over the apple cart,” he said. The Talisman Battery, oil on board, 2011.